We are keen to support local communities in the areas where our silver jewellery is made. In the north of Thailand there is a significant amount of poverty, particularly away from the towns and cities. People survive through menial or seasonal jobs and often grow vegetables and rear animals to help support themselves. EDF strongly believes that education is one of the most important keys in uplifting the quality of life of disadvantaged children and youths, and that in addition it prevents many social problems. Those with basic education can utilise and apply their knowledge to gain entry to skilled worker job opportunities or to higher education. This liberates them from poverty and prevents them from falling victim to low-paying, menial jobs or human trafficking. We received a letter from each of the girls we are supporting, and you will find a short introduction to each of them below. We will continue to update you on these girls and their progress and stories, as well as on the other children we sponsor. With your support we can help keep children in education and break the cycle of poverty in these communities. We also hope to have a positive impact on their families and to enthuse other children about the importance of education. In the profiles below, we also include the Thai nickname as it’s easier for Westerners to pronounce than the full Thai name. Nicknames are given at birth; often the name relates to what their parents like or what the babies look like or enjoy when they are small. Waranya (Cream) is fourteen years old. She lives in Chiang Mai province about 30km from Chiang Mai itself. Cream’s father passed away and so her mother remarried and moved away with her new family, leaving Cream to live with her aunt. Her aunt is a seamstress and earns a very modest (even by Thai standards) 2500baht a month: this is c. £50 a month or <£2 a day for two people to live off. That ís about the same as your daily Starbucks, to cover absolutely everything. Waranya takes a public bus to school. She has to get up at 5.30am to get ready and gets the bus at 6.30am. After a day at school she usually returns home at around 5.30pm, when she helps her aunt prepare dinner, washes the dishes and waters the trees they grow in the garden. She told us in her letter that she washes and irons her own clothes and generally tries to help her aunt as much as possible. Waranya wants to join the police when she is older so that she can help people. 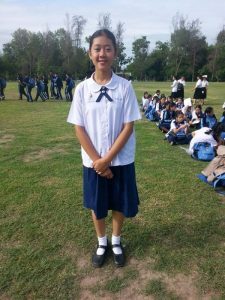 Plaifah is also fourteen years old and goes to the same school as Waranya in Chiang Mai province. Her parents are manual labourers and often they do not have enough money for all the family expenses. They plant vegetables and grow mango trees to help with the cost of food. Plaifah uses a shared song toa (covered pick-up truck with bench seating) to get to school, again leaving at 6.30am. When at home she tries to help her parents as much as possible but also makes sure that she completes her homework. In her letter she talked about the community spirit in her village and how when there is a festival or special event everyone helps to make it a success. Plaifah loves reading novels, which helps her learn new vocabulary but also allows her to get lost in the story! She also draws as a way of expressing her thoughts and enjoys using her imagination. 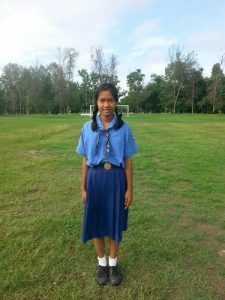 Plaifah wants to graduate from school and go to university so she can get a good job and support her parents as they get older. 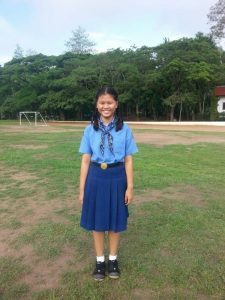 Cream (Pookam) is also fourteen years old and attends the same school as Waranya and Plaifah. She lives with her mother and little brother and grandparents. Her father passed away when she was five years old and so her mother is the breadwinner for the family of five. She is a menial worker and so often struggles to make ends meet. The school day is a very similar routine to Plaifah, Cream’s favourite subject is science, she particularly enjoys all the experiments they have to do. Her least favourite is Thai traditional dancing. She also likes sport, particularly badminton and running. She knows these are good for her health but they also help her relax.At home the family keep pigs and chickens and also grow fruit and vegetables, which are used both to eat at home and also to sell. At the weekend Cream helps her mother sell the fruit and vegetables on the market. Cream wants to be a nurse when she is older so she can help sick people. She herself suffers from asthma, and she wants to be able to help other people in need. Sign up on our website to follow our and their stories. 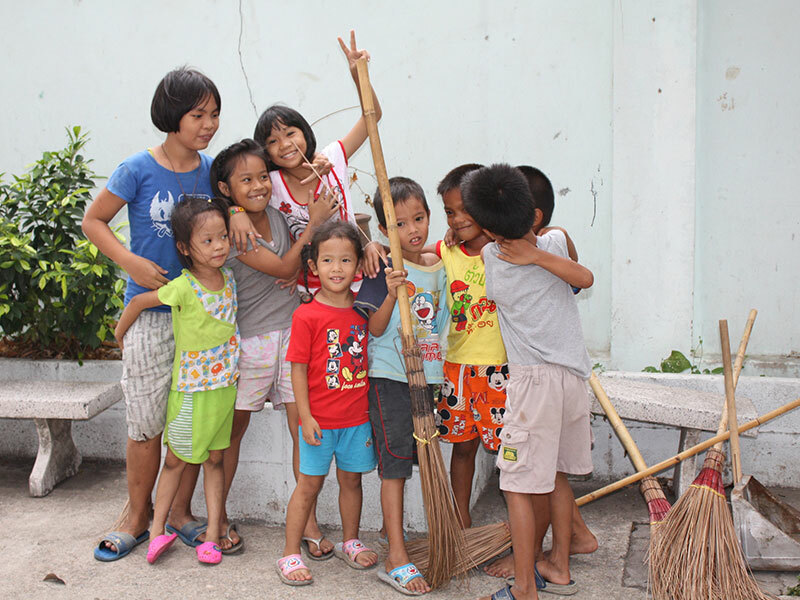 Follow us on Facebook for updates on Waranya, Plaifah and Pookam’s progress in school and to learn more about how poverty affects children in Thailand.